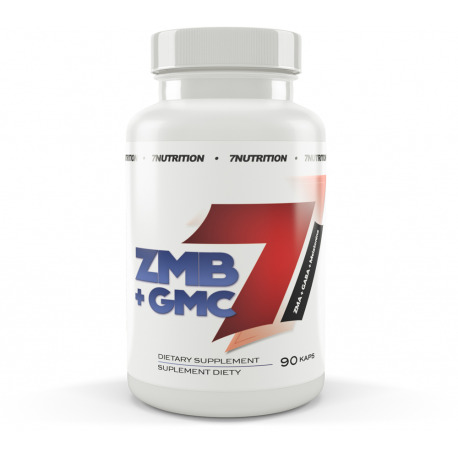 7Nutrition UBC + GMC is a preparation based on 7 substances whose activity affects the testosterone levels and speed recovery time. Prolonged strenuous activity significantly burden the body and it is worth to think about a way to strengthen. High-quality active substances such as GABA, melatonin, N-Acetyl L-Cysteine ​​(NAC) and vitamins and minerals for maximum efficacy. The most powerful SUPPLEMENT AND MOST COMPREHENSIVE REGENERATION NIGHT. The combination of magnesium citrate, magnesium oxide, zinc citrate and Vitamin B6 in high concentrations makes our proprietary formula UBC most optimal for the body. Increasing own testosterone production during the night to 40%, and growth hormone to 20% answer for increasing muscle mass, reduce body fat and improve training effects. Produced by decarboxylation of glutamic acid. Acid GABA has the greatest impact on sleep and regeneration of the body during sleep. It affects the relaxation of the body and increases the level of natural growth hormone. With acid GABA is a deeper sleep, the brain is more regenerated, and the whole body much more relaxed and ready to go after a good night's sleep. Further stabilizes blood pressure and reduces the risk of contraction. Known as the "sleep hormone" is produced mainly at night. After puberty, the human body produces a reduced amount of melatonin naturally, so it is worth the hormone supplementation before bedtime. Melatonin regulates the biological rhythm makes the sleep will be harder, reduced blood pressure, and thus will feel better recovery. It works synergistically with acid GABA. An additional advantage of melatonin is effective in removing free radicals. It is a powerful antioxidant, and this causes the human body with a number of diseases. Sulfur amino acid cysteine. Cysteine ​​is a part of structural proteins. It has a very strong antioxidant properties. It cleanses the body of toxins and free radicals. Participates in the synthesis of glutathione. The most powerful antioxidant of the human body. Glutathione rebuilds muscle proteins. It has anabolic properties and antioxidant. Cysteine ​​is particularly useful for hard-training, and people exposed to stress. It affects the physiological processes. Supports protection against free radicals making an excellent addition to a strong antioxidant - Cysteine. Positively affects the nervous system and sexual performance. It is very good for people who often use computers, cell phones and other devices that emit electromagnetic fields. Vitamin E forms a natural protective barrier for our cells. ENJOY deep DREAM HOLD, INCREASE TESTOSTERONE AND BARRIER PROTECTION FOR YOUR BODY. PREPARE YOUR BODY TO ANOTHER, ACTIVE DAY. Ingredients: magnesium citrate, magnesium oxide, zinc citrate, zinc oxide, pirodoksyna HCl, GABA, N-Acetyl-L-Cysteine, melatonin, tocopherol, gelatin shell, anti-caking agent: E470b.